Firm valuation is an exciting topic. It is interesting for those economists engaged in either practice or theory, particularly for those in finance. The literature on firm valuation recommends logical, quantitative methods, which deal with establishing today's value of future free cash flows. In this respect firm valuation is identical with the calculation of the discounted cash flow, which is often only given by its abbreviation, DCF. There are, however, different coexistent versions, which seem to compete against each other. Entity approach and equity approach are thus differentiated. Acronyms are often used, such as APV (adjusted present value) or WACC (weighted average cost of capital), whereby these two concepts are classified under entity approach. Why are there several procedures and not just one? Do they all lead to the same result? If not, where do the economic differences lie? If so, for what purpose are different methods needed? And further: Do the known procedures suffice? Or are there situations where none of the concepts developed up to now delivers the correct value of the firm? If so, how is the appropriate valuation formula to be found? These questions are not just interesting for theoreticians; even the practitioner who is confronted with the task of marketing his or her results has to deal with it. We will systematically clarify the way in which these different variations of the DCF concept are related in this monograph. A preliminary version of the manuscript was published at the Social Science Research Network (see links on the left), but did not contain two important aspects: We had not implemented default and we did not show how to handle personal income taxes. You find the table of contents and and an excerpt of the first chapter on this website. See also our Errata-list for the first edition. Lutz Kruschwitz and Andreas Löffler, Hannover and Berlin 2005. Andreas Löffler has recorded a video-stream (0:37 h) with a practical application of the WACC-approach: How does it work, what information is necessary, what are the relevant steps and what caveats do exist? You find that video on the web (Adobe Flash Player necessary). Andreas Löffler has recorded video-streams for some sections of the book (QUT Brisbane, Spring 2011) as well as a German class (Universität Paderborn, Winter 2009). You need Adobe's Flash Player and can download handouts (PDF) for the class. All material was written in LaTeX (using Till Tantau's beamer class, in case you think PowerPoint would be the better program to present slides you should read Edward Tuftes essay on PowerPoint). In case you want to change the slides you can also download the complete LaTeX source code of the material. If you are a teacher you can obtain our Solution Manual from us. For the infinite example with corporate income tax and personal income tax. "Compared with the huge number of books on pragmatic approaches to discounted cash flow valuation, there are remarkably few that lay out the theoretical underpinnings of this technique. Kruschwitz and Löffler bring together the theory in this area in a consistent and rigorous way that should be useful for all serious students of the topic." "This treatise on the market valuation of corporate cash flows offers the first reconciliation of conventional cost-of-capital valuation models from the corporate finance literature with state-pricing (or ‚risk-neutral' pricing) models subsequently developed on the basis of multi-period no-arbitrage theories. 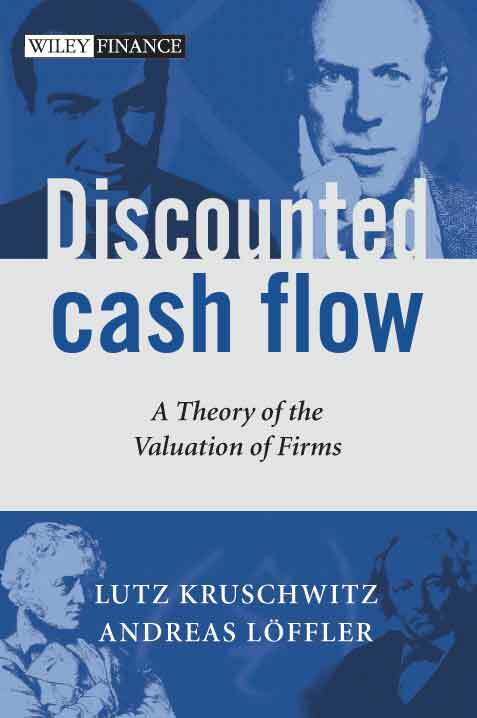 Using an entertaining style, Kruschwitz and Löffler develop a precise and theoretically consistent definition of ‚cost of capital', and provoke readers to drop vague or contradictory alternatives. " "It is an interesting book, which has some new results and it fills a gap in the literature between the usual undergraduate material and the very abstract PhD material in such books as that of Duffie (Dynamic Asset Pricing Theory). The style is very engaging, which is rare in books pitched at this level." "Handling firm and personal income taxes properly in valuation involves complex considerations. This book offers a new, precise, clear and concise theoretical path that is pleasant to read. Now it is the practitioners task to translate this approach into real-world applications!" Who's Who on the cover?